I am a marine ecologist broadly interested in the interaction of human and natural systems. My research follows two major themes: ecosystem management and invasive species. I am currently a Visiting Scientist with the North Pacific Marine Science Organization (PICES) working on the impact of tsunami debris. 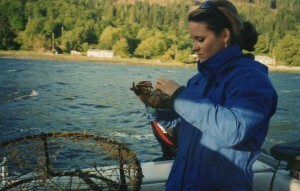 My postdoctoral research focused on risk assessment and the cumulative impact of human activities in the marine realm. I also investigate the introduction and spread of invasive species; my dissertation research examined the role of recreational boating in carrying potentially invasive subtidal marine species. Clarke Murray, C., Agbayani, S., & Ban, N. C. 2015. Cumulative effects of planned industrial development and climate change on marine ecosystems. Global Ecology and Conservation, 4, 110-116. Clarke Murray, C., Agbayani, S., Alidina, H. M., & Ban, N. C. 2015. Advancing marine cumulative effects mapping: An update in Canada’s Pacific waters. Marine Policy, 58, 71-77. Clarke Murray, C., Gartner, H., Gregr, E. J., Chan, K., Pakhomov, E., & Therriault, T. W. 2014. Spatial distribution of marine invasive species: environmental, demographic and vector drivers. Diversity and distributions, 20(7), 824-836.